Harpic original white sand shine is an excellent toilet cleaner that is so easy to use and it works beautifully.A brand l always buy for a clean toilet! This is a nice thick toilet cleaner that slowly slides down the toilet bowl and does a great job removing the poo. As a domestic cleaner I get to try lots of different products and I have used this many times at work and home. I find it works best if you squirt it under the rim and also around the rim and leave it for at least an hour to do it’s job. When you go back to clean the bowl the work has been done for you. Harpic is a brand I trust and Harpic is a brand that works.Harpic Original White and Shine works well and gets the job done everytime! We use this in the toilet and it does a very good job – we use it once or twice a week and it keeps the toilet clean and smelling nice. I would highly recommend this to anyone needing to clean a toilet. Even on the worst stains this brings the toilet back to being stunning. 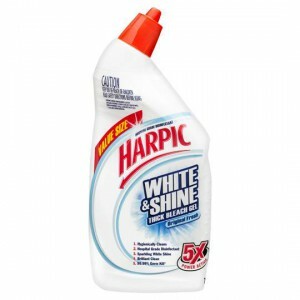 How would you rate Harpic Original White & Shine?